Bassein beach is nearly 70 km away from the Mumbai city. Bassein is a great tourist attraction for tourists as it offers natural as well as artificial sight for the tourists. It is a great picnic spot for the people of Mumbai. Bassein is reachable from the Vasai road station. It takes half an hour to one hour to reach the beach from the road station. The scenic beauty of the beach is a must watch as it offers the greatest natural sight to the visitors. The clear sand of the beach is great for lying down on the beach and relaxing for hours. People love to make one day’s visit to this place to escape from the busy schedule of city life. Apart from the scenic beauty of the beach itself there one will find beautiful places like Akloli hot spring, Portuguese forts, Vajreswari temple and Nalasopara village. The fort there bears great historical significance. It depicts the winning of Marathas over the Portugal. The visit to the fort can be a great leisurely engagement. Akloli hot spring located near the Vajreswari temple is a must visit for the visitors. The hot spring bears many chemicals like sulphur that is great for skin diseases. Running water tubs have been set up near the hot spring where devotees can take a dip. Nalasopara village is a great place to see Buddhist relics. This village is coming under Vasai Taluka. This village is famous for great architecture and gained a status of historical place due to its architecture. The place is perfect destination for picnicking with family and friends. The serene atmosphere of the beach is so luring that it provokes the visitors to stay for days. But it is mostly visited for one day picnicking. Many visit the Bassein beach on weekends to revive the lost mood and energy. The beautiful sandy beach is a great place for walking and sun basking on the sand. The beach is not ideal for bathing as the sea is quite deep here. One will find tourists and visitors playing in the beach and taking sun bath in the beach. But playing in the water is not advisable here at the Bassein beach. The natural sight at Bassein each is more fabulous as one will find a lot many palm trees encircling the beach. It is great for one day stay. The green backdrop on the sandy beach is a real place for relaxation. 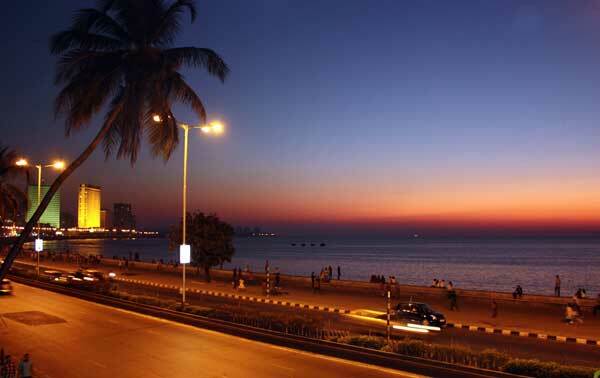 The city dwellers of Mumbai find it suitable for weekend relaxation. The view of sunset here at this beach remains as a memorable experience with the visitors. This less crowded beach surrounded with greenery is suitable for relaxing in the lap of nature. One will find coconut water in the beach and some other snack items are also available in the beach side. It is now gaining attention as a tourist destination. People love to spend the day as well as evening in the beach. The moonlit beach in the night gives great deal of peace to the visitors. Many love to enjoy the moonlit night on the calm and solitary beach.